A classic example of old tom from Christian Jensen, a sweeter style of gin popular in the mid-19th century. This is made to an 1840s' recipe and is naturally sweetened with botanicals. Nose: Prominent juniper accompanied by grapefruit, lavender and soft coriander. Palate: Concentrated blend of botanical aromas with sage and a natural sweetness. Finish: Long and powerful with the citrus, juniper, liquorice and floral notes. 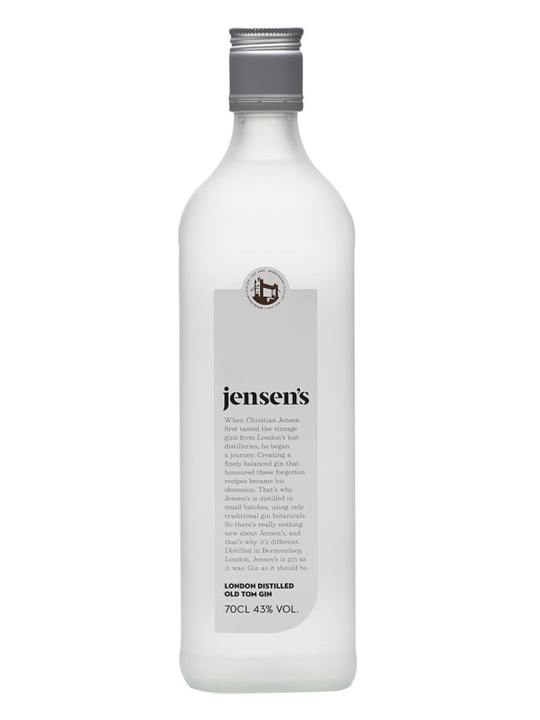 N: More intense than the Jensen's Dry, and again the juniper is very prominent, this time accompanied by grapefruit notes, lavender, coriander and a very pleasant meadowy character. Becomes more floral with time, with hints of orange flower water. P: Extremely concentrated blend of the botanical aromas from the nose: juniper,liquorice, some citrus. Strong violet and lavender mid-palate. A slightly cereally background with sage and a natural residual sweetness. F: Long and powerful with the citrus, juniper, liquorice and floral notes all lingering. A slightly menthol quality. C: More challenging than the Dry due to the powerful, uncompromising flavours. Perhaps less approachable neat for this reason, but this Old Tom will be a knockout in the right cocktails. A large high-street retailer now sells this Gin. However don't be reeled in by the modern looking bottle. This gin prides itself on traditional values and taste, but for me it was just too bland and un-inspiring. It actually tastes like there are a couple of essential botanicals missing from this gin. If you want this taste from a gin you can probably find it in a lot less expensive mainstream high street gins. I don't even think I will be drinking the rest of this if anyone else fancies it! Tried it at a friend's......took the rest of the bottle home with me!! It's brilliant. Try this in a Tom Collins since this is, clearly, what goes in a Tom Collins! The flavours add much more depth! I tried this last night in "The Hide" on Bermondsey St. It is superb, I am ordering a bottle now.